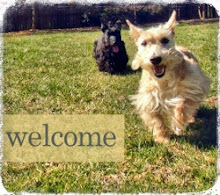 As a Scottie Mom, one of the worst things you can hear is that something is wrong with your dog. The only thing I can imagine that could be worse than that is hearing that something is wrong with your Scottie because of something you did (or didn't) do. 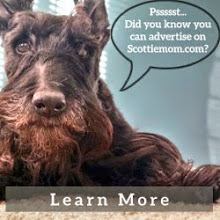 Well, I can add this experience to my list of Scottie Mom-isms. Yesterday, when we arrived for Thanksgiving dinner at Scottie Grandmadre's house, Mr. K tried to beat me up the stairs and just as I was putting my foot down to take a step, he placed his paw right underneath it. All of a sudden, I heard a loud CRACK! I instinctively lifted my foot as quickly as I could and a panic began to set in. I just stepped on my dog. Oh my goodness, did I break anything? Mr. K's so little. Could his paw withstand that kind of weight? What did I do? I felt awful. I looked down. Mr. K, seemingly uneffected, continued up the stairs as he had before. Perhaps I was dreaming...maybe I just thought that was his paw when it was really something else? When we arrived at the vet, we let Heather get looked at first. She has a suspicious mole that seems to be slowly growing and hardening over time and I was concerned about what it might mean. Luckily, it turns out that spot on her back is a benign tumor. We'll be removing it soon when I take her back for a dental. Then, a vet tech came by to check out Mr. K's paw and took him to the back to cut off the damaged part of the dew claw. I tried to relax as I listened to the vet talk about Heather when, in the middle of our conversation, I tuned everything out but the sound of my baby boy's cry. I've always heard that moms know their baby's cry from anywhere in the world. Well, today I found it was true and I felt all the more awful I had put my darling puppy in this predicament. When the tech came back with Mr. K, he was seemingly back to himself aside from favoring one paw over the other. They put a little solution on his claw to prevent the remainder of the dew claw from bleeding and when they showed us the broken piece of claw, the vet's reaction says it best: eyes wide open and a solid, "WHOA!" Feel better soon, Mr. K - I'm so terribly sorry and hope you can forgive me. Scottie Mom loves you! How awful for both of you! Hope poor Mr. K is running around again very soon. Poor baby.... sometimes they don't let us know about their little ouches unless they are in real pain. And with the dewclaw is never really in use, no pressure is really put on it, so no real major damage to his little foot! I hope Mr. K feels better soon! Yes they are awfully tough! I worry that they are hurt and I still wouldn't know!